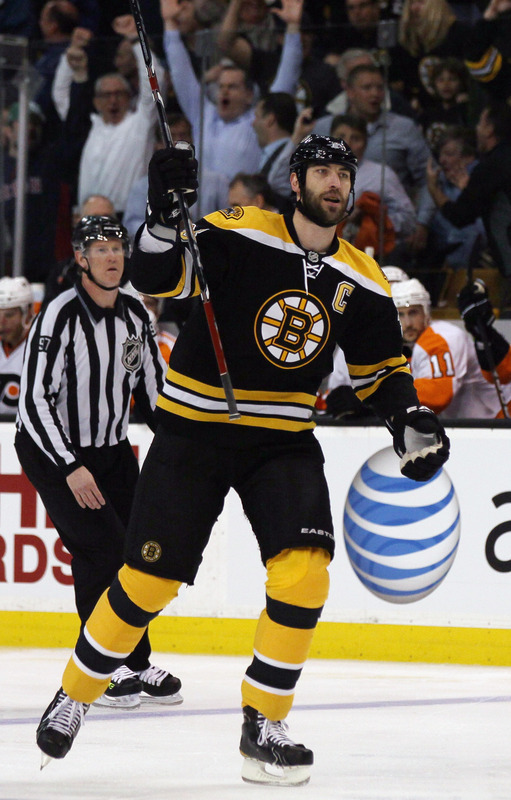 After a steal of a win in Game 2 the Bruins earned a 5-1 win in Game 3 to take a 3-0 series lead over the Flyers. The Bruins got two goals within the first 1:03 and then chipped in with two more goals before Zdeno Chara added a much needed power-play goal in garbage time. Chara bookended the game with goals and was +4 and Nathan Horton had a goal and an assist in front of Tim Thomas‘ 37-save effort. The Bruins used physicality early to beat down the worn out Flyers and played well in all three zones. Two nights after the home Flyers took a lead 31 seconds into the game the Bruins had a 1-0 lead of their own one second faster. The play started when Patrice Bergeron made a great pass to the doorstep to Brad Marchand who nearly converted but was stopped by the pad of Brian Boucher. Marchand then won the puck behind the net and kicked out to a trailing Zdeno Chara who blasted it home right over Boucher’s head. The Bruins would score less than 35 seconds later when the Bruins top line finished off a nice quick shift with a David Krejci goal. The Bruins did a good job along the boards and Milan Lucic finished the play by throwing a pass to Krejci out front. Krejci exploited a hole in the Flyers zone and then tapped home a shot on top of Boucher. Peter Laviolette immediately took a timeout to try to calm his team down. The Flyers did a decent job of slowing the Bruins down in the following minutes by bogging them down in the Bruins zone and forechecking well. The Bruins would have some threatening rushes but they never materialized. The Flyers would get the first power-play of the game when Milan Lucic was called for goaltender interference on a chaotic moment with Boucher out of his net and a hard to find puck. The Bruins penalty-kill cleared the puck four or five times and kept the Flyers on their heels throughout. The Bruins got a lot of momentum back after the kill and showed it through physical play at every opportunity. The big hits came within the Bruins rigid defensive system but let the Flyers know that they weren’t scared. The Bruins would take another penalty late in the period when Patrice Bergeron was called for hooking. The Bruins would kill off the first 16 seconds and the period would end. The Flyers started the second with 1:44 left in their power-play and threatened for the first minute or so with nice movement in the Bruins zone but came away without a goal. The Bruins responded with a few good shifts in the Flyers zone and a fight between Nathan Horton and Sean O’Donnell that was pretty even. The Bruins would earn their first power-play early in the second period on a James van Riemsdyk high-sticking call deep in the Bruins zone. The Bruins did a good job on the power-play, keeping it in the zone a lot and getting some decent looks but were caught forcing passes and couldn’t score. Overall, the Flyers played a much better second period, cutting down on mistakes and putting together a more consistent offensive game. They did leave a lot of holes on the rush as their two forward forecheck led to odd-man rushes the other way. One such example turned into Daniel Paille goal. The Bruins broke up a Philly pass deep in their own zone and then Gregory Campbell led out a 3-on-2 the other way. Campbell fed Paille behind a Shawn Thornton net crash and Paille picked the post glove side and in for the Bruins third goal. Nathan Horton would get the Bruins fourth goal on an inauspicious entry into the Flyers zone that beat Boucher five-hole. Horton’s third point of the night was more or less of a half-hearted attempt to get it on net. Boucher anticipated shot too soon and then got caught between standing and butterfly and left a wide-open hole for Horton to score on. The goal would end Boucher’s night. Andrej Meszaros would get the Flyers on the board with a nice wrist shot on a 3-on-2 by the Flyers. Darroll Powe fed a nice cross-zone pass to Meszaros who cocked and wristed a shot under the crossbar, beating Thomas over his shoulder. The goal was pretty similar to Paille’s goal in that it was developed thanks to a strong net drive. The Bruins would get a late power-play when Kimmo Timonen hooked down a Bruins on a would-be 3-on-1. The Bruins would use the umbrella and got two good chances, hitting a post both times on the cold Sergei Bobrovsky within a few seconds late in the power-play. The Bruins would take a three-goal lead to the third period. The Bruins came out with a simple strategy in the third period, play within yourself. They made sure the back end was sewn up before creating offense and made a lot of passes to ensure increased puck possession. Thomas remained sharp when need be. The Flyers couldn’t sustain any type of offense as the Bruins remained calm along the boards and strong in the neutral zone. The Flyers nearly scored with around eight minutes left when Sean O’Donnell fired home a loose puck after Tim Thomas made a save but was out of position. As he shot Scott Hartnell dislodged the net and the referee immediately waved off the goal. Down by three, the Flyers would pull their goalie with 2:10 left in the third period. The Bruins would nearly score a few seconds later but Mike Richards would hook down Bergeron. Braydon Coburn would then make it a two-man advantage seven seconds later with a hit from behind. The Bruins power-play drought would mercifully end with a Zdeno Chara blast from the top of the 5-on-3 formation, beating Bobrovsky high. The shot was similar to his first goal, blasted right under the bar. The Bruins would go on to take a 5-1 victory home and a 3-0 series lead. Where have we seen this before? Bruins played probably their most complete game of the postseason. Offense converted on chances, defense was great in their own zone, forechecking and physicality was through the roof and Tim Thomas was Tim Thomas. Not much to complain about. Zdeno Chara had himself a monster of a game. Two goals +4 over 28 minutes on the ice. Adam McQuaid only plays about 15 minutes a game but that’s a lot to make up with essentially a five man defensive corps. It was exactly what they needed from their captain. Got to admit I’ve been surprised that Boucher keeps getting starts after Game 1 where he was terrible. Laviolette has had almost blind trust in the guy but he’s been really really bad. Horton’s goal was almost embarrassing to watch as a Bruins fan. There’s no way a playoff goalie should let that in. Brad Marchand. Was Everywhere. Hits, chances, and general shenanigans. Kind of funny how the smallest guy on the ice led the game with 7 hits. Didn’t know he had it in him. Marchand also had 7 of the Bruins 23 hits. Here’s a fun pseudo stat. I’m like 90 percent sure that the posts made as many saves as Bobrovsky did when there were five minutes left. Three apiece. The Bruins didn’t need to create offense and Bobrovsky wasn’t bad, in fact I like him, but that’s just something I noticed. Tim Thomas has now stopped 82 of his last 83 shots. Not too shabby. Faceoffs 43-12 in favor of the Bruins. That’s some NHL 11 stuff when one player doesn’t care to learn how to do the new faceoff system. Also, a great indicator in which team wanted it more.